Space Cowboy Boots is the ONE AND ONLY premier Western boutique in New York City. Shop here and indulge in our 30 years plus experience in traditionally handmade, in-stock and custom, curated cowboy boots. These shirts are heavenly. 70% organic bamboo/30% organic cotton. Bamboo is the fastest growing plant on Earth and requires very little water to grow. The discharge printing process allows the ink to absorb into garment, producing a fine, soft feel.We have limited batches of our custom shirts. 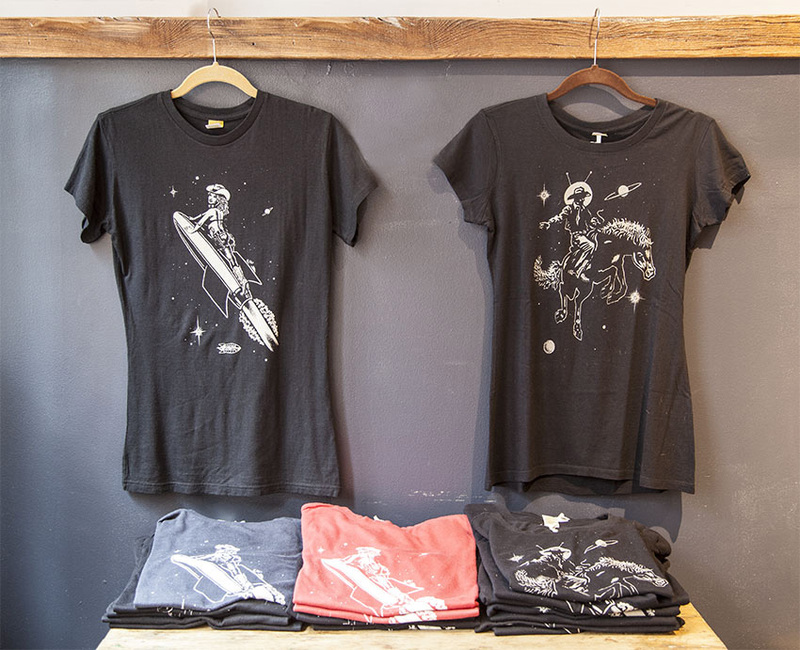 Now available in colors Midnight Blue and images of Bull-riding Girl, and Our Space Ship logo. All illustrations and designs are made by our friend, NYC artist Zito. For wholesale info, call 646-559-4779. Space Cowboy has a small but high quality Western hat selection. You can find, leather, straw and fur hats online and at our Nolita, NYC store. Last (or second to last pair) left of some awesome handmade boots. Find your size and grab the deal! ** We accept return on Clearance boots for store credit ONLY!